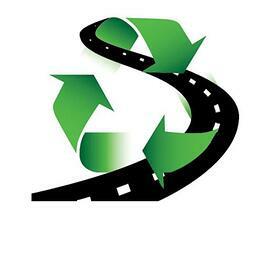 Did you know that asphalt pavement is America's most recycled material? Each year roughly 100 million tons of asphalt pavement material is reclaimed. Of that 100 million tons, about 95-percent of that is reused in roads and highways, saving taxpayers money by reducing the cost of roads. At Wolf Paving, we recycle 100-percent of the asphalt we remove from job sites at our own asphalt production plants. We also recycle asphalt shingles and concrete - turning these materials into new asphalt pavement. Recycling helps us produce numerous custom mixes of asphalt for a broad range of project types. Recycling old asphalt reduces the amount of new oil needed in the construction process and may reduce dependence on foreign oil. Recycling saves on construction material waste since the recycled material is not sent to a landfill. Recycling the mineral particles that are produced during the process of asphalt pavement helps conserve natural resources. Taxpayers save money with asphalt recycling. Contractors save by reducing energy, materials, and transportation costs. Asphalt can be recycled multiple times, ensuring its value. The asphalt recycling process begins with milling. Asphalt milling is a recycling and re-paving procedure, aimed at removing the top layer of asphalt from a street, parking lot or driveway without disturbing the sub-base. Once the asphalt is milled up, it is taken to an asphalt plant where it's screened and sized again and then used to make new pavement. In most cases, the quality of this "renewed" asphalt is better than pavement made from brand new materials. 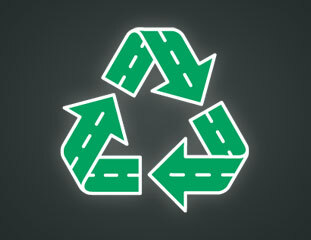 Asphalt can be recycled and reused many times, giving these materials a very long lifespan. You can learn more about our milling services by downloading this free whitepaper. Asphalt can be recycled without even moving it from a job site using pulverization. It saves money: Old base layers don’t have to be excavated and new material doesn’t have to be hauled in. It’s fast: The reconstruction process goes quickly when everything is done right in place. It’s environmentally friendly: Since new base materials don’t have to be produced and brought to the site, it’s one of the most environmentally friendly options available. Asphalt pulverizing is a great way to take an existing pavement, recycle it, and make it even stronger and longer lasting than the original pavement. To learn more about asphalt pulverizing, check out this blog! Recycling through pulverization reduces our costs and yours, while at the same time, keep the planet healthy. Using recycled asphalt shingles has several benefits in the production of Hot-Mix Asphalt (HMA). By reusing asphalt from shingles, asphalt manufacturers can reduce costs and improve the quality of asphalt pavement. Using recycled shingles provides a source of aggregate, which reduces the need for mined aggregate. Recycled Asphalt Shingles (RAS) can be used for a variety of different asphalt-based materials. Rural roads can be covered in gravel that is mixed with the RAS. Using this material minimizes the amount of dust produced and reduces the amount of gravel lost. RAS can also be used as a temporary surface for roads, driveways, or parking lots. Asphalt shingle recycling is not a simple process. Since improving the environment is one of the main goals, recyclers must be aware of the environmental considerations. For example, it’s important to keep the recycling dust to a minimum and to prevent other undesirable materials from being mixed in. Local, state, and federal regulations often focus on the possibility that asbestos could be present, but this is typically not found in the shingles themselves but in other roofing products, such as roll roofing, adhesives, paints, or waterproofing compounds. Therefore, recyclers have to be aware of and protect against asbestos contamination during the roof removal process. Nonetheless, the advantages of recycling outweigh these considerations. If one ton of asphalt shingles recycled equals about one barrel of oil, the environmental and economic benefits speak for themselves. If all 11 million tons of waste could be recycled, it would save 11 million barrels of oil from being used to create new asphalt. The use of recycled asphalt shingles, or RAS, has been fairly limited in the past, though, mostly because roofing materials contain a lot of extra material besides the asphalt itself. For example, roofing shingles may have nails, plastic, fiberboard, paper, cellophane, and wood. This makes the recycling process much more challenging. There was a time when the majority of used concrete was sent to a landfill. Not only does used concrete take up a large amount of landfill space, but it costs money (as much as $0.25 per ton per mile) and resources to transport it and/or dispose of it (as high as $100 per ton). These days, about 100 million tons of concrete are recycled annually. Most concrete is fairly simple to recycle. Essentially, the concrete is broken, removed, and crushed into a specified size and quality. Other materials, such as reinforcing steel, and contaminants, such as asphalt, have to be removed during this process as well. Once the material is clean and of the right consistency, it can be reused just like new concrete. At Wolf Paving, we think concrete recycling is an important part of our overall sustainability efforts. We take recycled concrete and crush it for later use. For example, we might use it as an aggregate in the creation of new asphalt sub base to be used on paving projects. Learn more about the green paving solutions. We own our own asphalt production plants where we recycle and reuse materials from all our jobs. 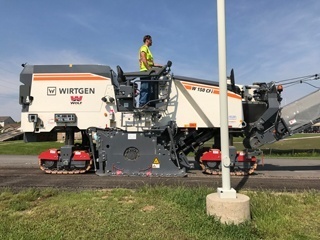 This gives us direct control over all our materials and removes the middle man to make sure our customers have the most competitive pricing on asphalt materials. At Wolf Paving, we care about recycling because we care about the environment and doing the right thing. If you need a paving job done right, contact us for a free estimate. You’ll never know if the material on your driveway is from a roof or another road, but you’ll know we incorporated as much recycled material as possible!